Emotions are synonymous with people, and photography for me is an expression of emotion. So it stands to reason that portraiture is one of the most powerful styles of photography that, when captured artistically, can create strong feelings in a viewer on an emotional level that no other genre of photography can create. 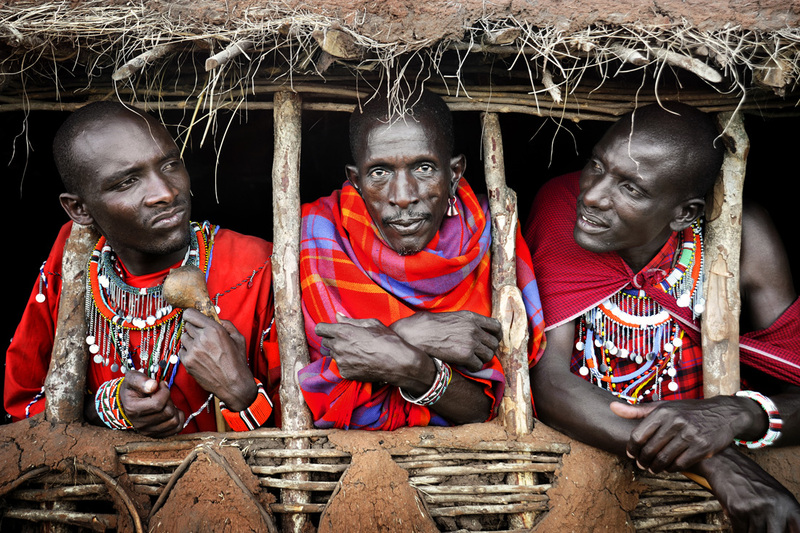 As a travel photographer and artist, I’m interested in capturing expressive faces that convey a sense of story, character, individuality and culture. Finding the right person to photograph is one of the biggest challenges, and it can take considerable time searching, exploring and meeting people from all walks of life to find that special someone with a captivating and powerful face, perfect for portrait photography. Here are my most important tips and techniques to help improve portraiture skills. The key to taking successful portrait photos is the ability to create a rapport with your subjects and make them feel comfortable with you. This can be done fairly quickly if you are relaxed, good natured, enthusiastic, and show interest and respect to those you meet. The skill of meeting someone new and making them feel relaxed around you in a short time can be practiced by approaching others with a smile and a sense of curiosity to learn more about them. It’s important not to come across as being shy. It’s also best not to rush in with your camera to take someone’s photo, but rather take the initial moments to get to know each other’s personalities, character and establish a connection. 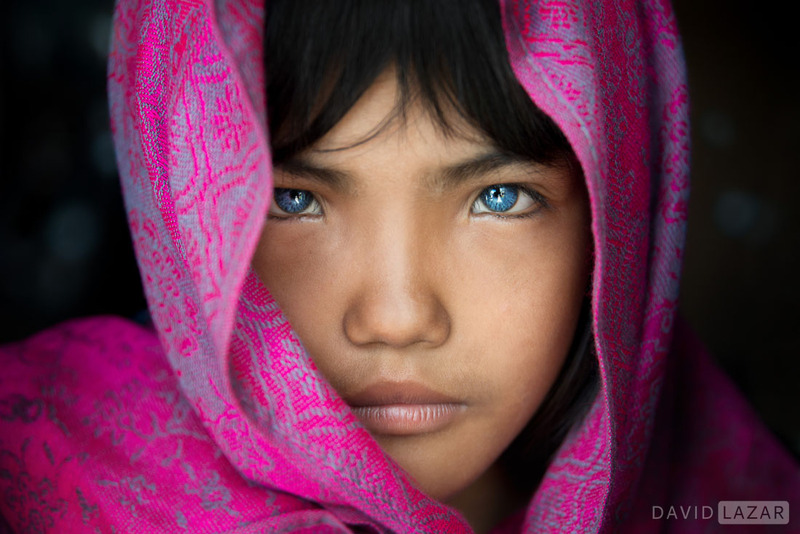 I spent some time with blue eyed Phuoc An and her family before taking this photo, Vietnam. I wandered into a monastery and got to know the monks after exploring the area and interacting, Myanmar. We should never forget that strong light on a subject is a necessity for a photo to be engaging and powerful. It’s important to be thinking about where the light is coming from every time you take a photo. Since I only use natural light in my travel photography, I always look around the scene or up to the sky to find where the brightest area of light is, and then make sure the subject’s face is angled appropriately to it. Front on light or side lighting often works best for me. I avoid using direct sunlight unless the sun is low and soft such as at the very early and late times of the day. Hard sunlight on a face creates unflattering black shadows that will detract from the artistic merit of the photo. Most of the time, I photograph faces under cover or when a cloud is covering the sun, while making sure the face or body is angled towards the strongest area of light. 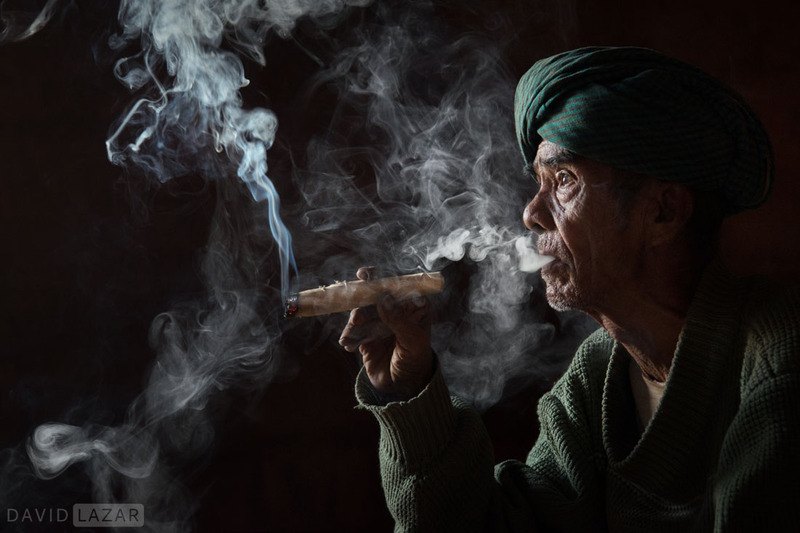 This man sits in a dark space facing an open doorway to bright outdoor sunlight, Myanmar. 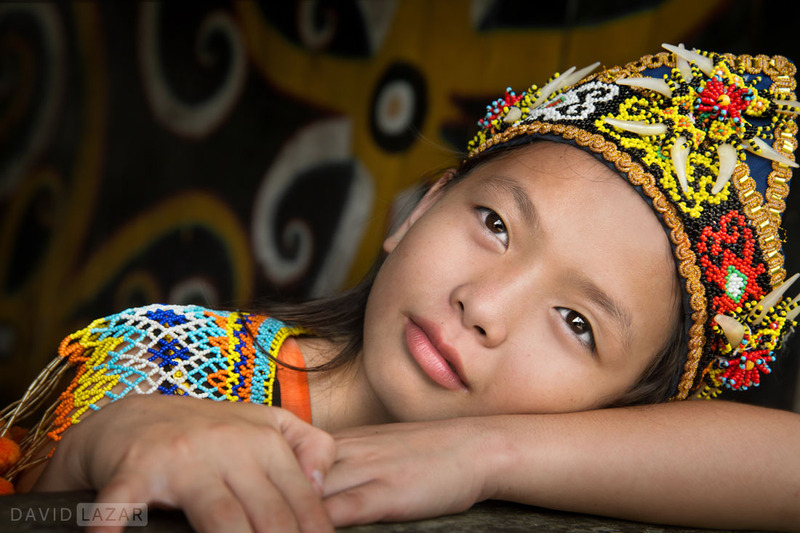 I asked this Dayak tribe girl in Indonesia to look up to the sky in order to get strong light in her eyes and on her face, avoiding dark shadows. An easy mistake to make while photographing a person is to have all your attention on the subject and to be only concentrating on their face when you put the camera to your eye. But the key to taking artistic portraits is in the background. You must see the overall scene and be conscious of everything that’s in the frame. Look for clean backgrounds and ideally ones that complement the subject, perhaps in texture, colour or environment. The first thing I always think about is the background, and then I envision the photo as a whole and the relationship of the subject to the background. 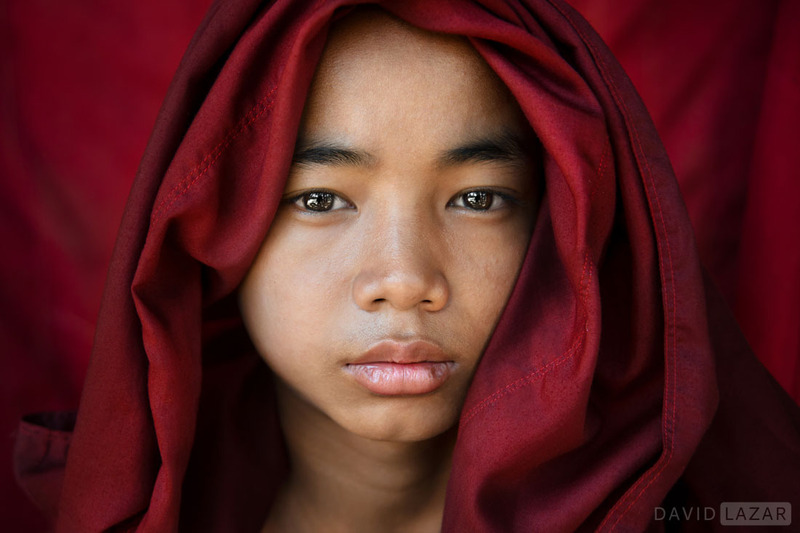 A hanging red robe is a simple but effective background here as it is both relevant to the subject and focuses all attention to the monk’s face, Myanmar. 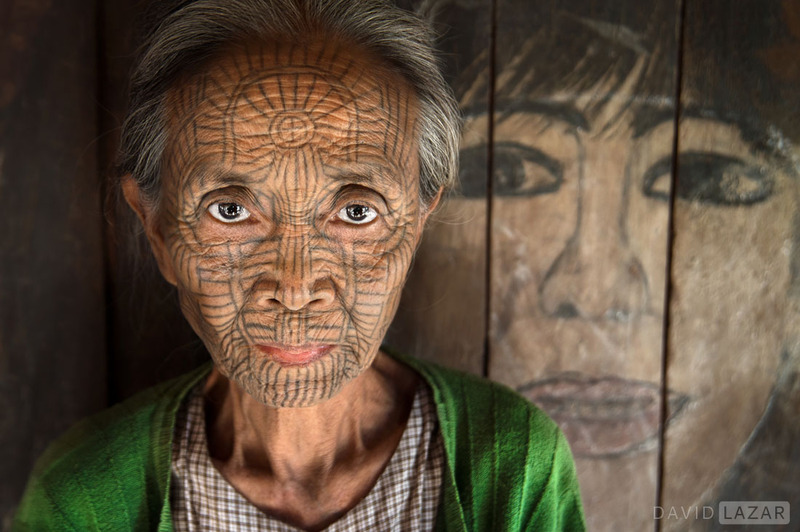 I found this wall with a painted face on the outside of this Chin tribe lady’s house in Myanmar, and positioned her in front of it. While rules can be broken and sometimes it can work to have eyes hidden in a portrait, it’s usually best to feature the eyes strongly with catch-lights reflecting around the iris. Make sure the eyes are in a part of the frame that will garner the most attention from a viewer. Positioning eyes too close to the edge of the frame is usually less powerful, for example. 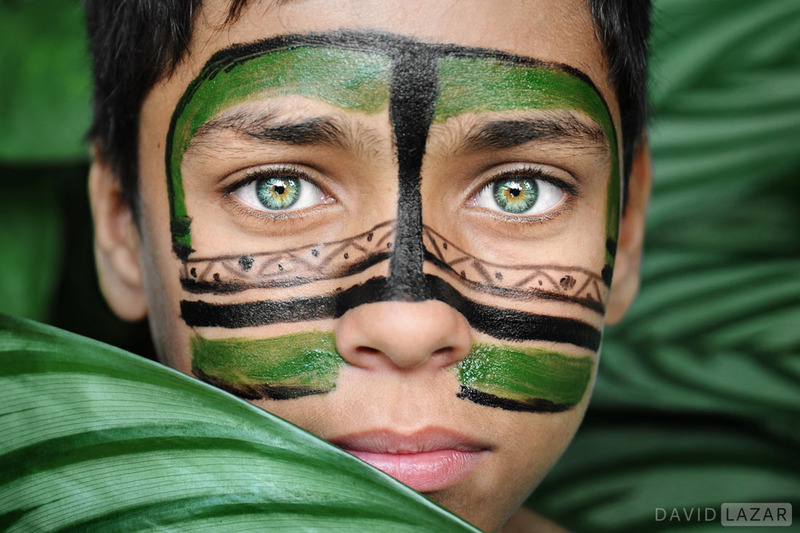 If the face is the main feature of the photo, keep the photo tight and close and always focus the lens on the eyes, as it is imperative that the eyes and eyelashes are in strong focus. I focused on Raisah’s eye lashes to make her eye the sharpest part of the photo, and positioned it in upper right third for a strong composition. The bright green eyes were an obvious focal point for this portrait, so I framed this photo tight and placed the eyes in the upper third. 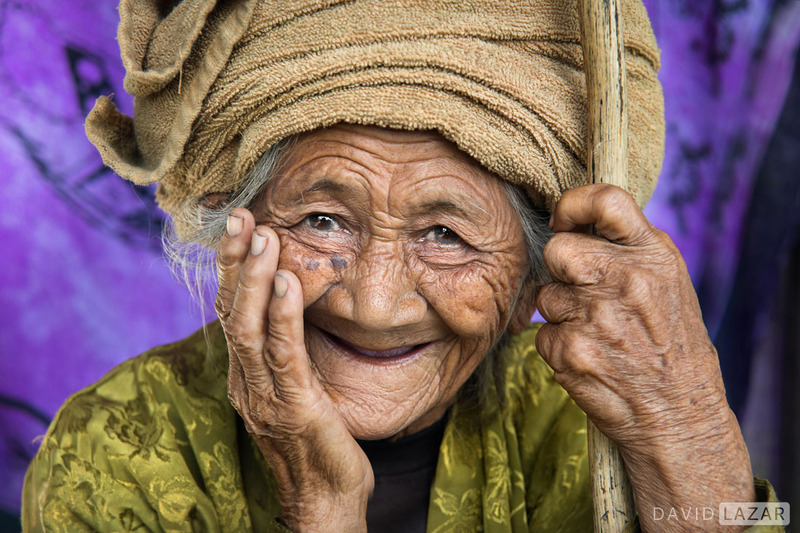 Try to capture a range of emotions in your portraits. Once you become more comfortable interacting with people you can indicate or encourage a particular expression, for example a serious face or looking out and away from the lens. Smiles are best when they are genuine and better yet are moments of pure laughter, but it usually works best to observe and bring out the natural personality of the individual you’re photographing. While some faces are suited better to a warm smile, others are more powerful with a simple and seemingly expressionless face. A little bit of direction from the photographer is often welcomed by a subject when being photographed and it’s important to have a variation of emotions in your folio to keep it interesting and engaging. 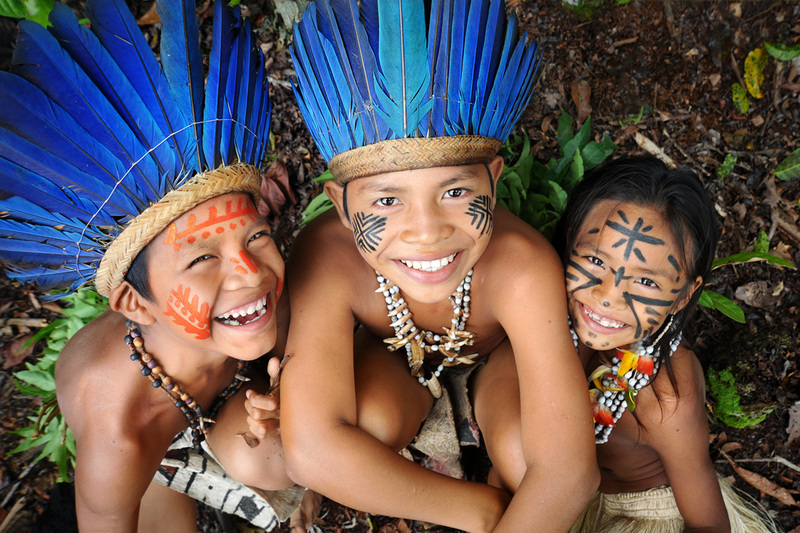 I encouraged these happy kids from the Amazon in Brazil to laugh, by being a bit silly and keeping the mood fun. Make sure to smile and be relaxed yourself, and your subjects will also feel relaxed and understand you that want to have fun and create something positive together. 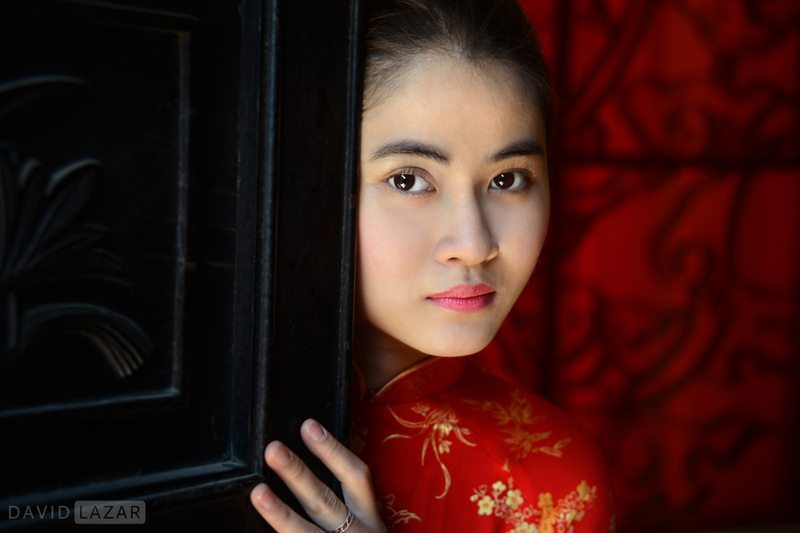 I was photographing this lady in a traditional red dress in Vietnam, and when I saw this background I knew it would be perfect with its simplicity and recurring patterns, and most importantly a single colour that matched the subject. She has been framed centrally with an even amount of space either side of her, and her face touching the door helps draw attention to her eyes. A simple, relaxed expression bring an intriguing and intimate mood to the portrait, and works better than forcing a big smile that probably wouldn’t look natural here. 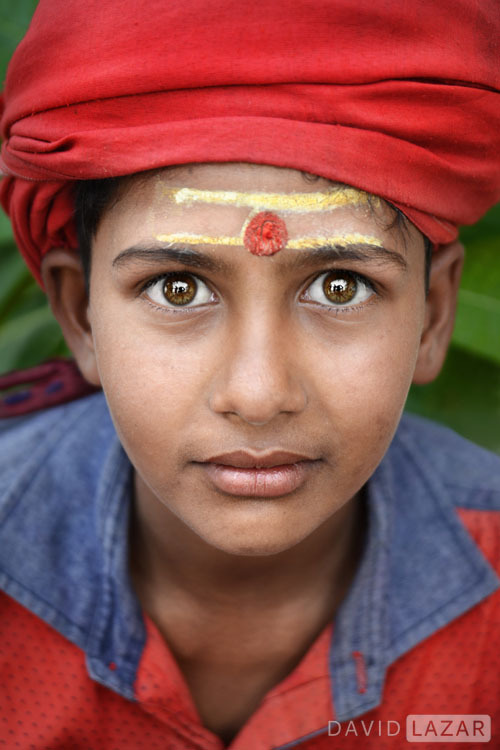 I featured this bright eyed Indian boy’s eyes in the upper third of the frame, and had him kneel down in front of a plant that could provide a plain coloured background, in a location that was cluttered and full of activity (Varanasi). The light on his face is even light in a shaded area out of the direct sunshine, and you can see the bright sky reflected in his eyes. 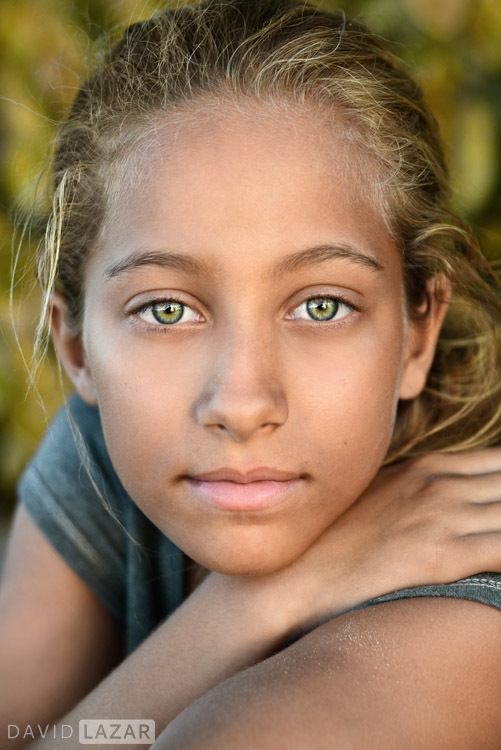 I was taking portraits for Growing Leaders’ Who Will I Become Book in Trinidad and Tobago (Caribbean), and this girl with green eyes was organised to meet us on the beach. I made sure to meet a bit before sunset, allowing some time to interact, and soon after I asked her to kneel down on the sand directly in front of the almost set sun for the best light at that time of day. I had previously looked around for a background that was complementary, and noticed a shrub large enough to cover the space behind her, with a consistent pattern and a colour that would match her eyes. In having her lean down on her knee, she looks more relaxed and engaging than if she were simply standing upright. Impresionantes tus fotografías y me han encantado las explicaciones, muchas gracias por compartir tu pasión!!! Awesome your pictures and I’ve loved explanations, thank you very much for sharing your passion !!! Gracias, and I’m glad you enjoyed this article. Very good tips , I have learnt so much just looking at your books . Thanks Cesar, and I am glad you have enjoyed and learnt from the books. All the best. Awesome tips. And great pics! Wonderful images and solid tips. Thanks Doug, it’s much appreciated. Thanks for the tips ! 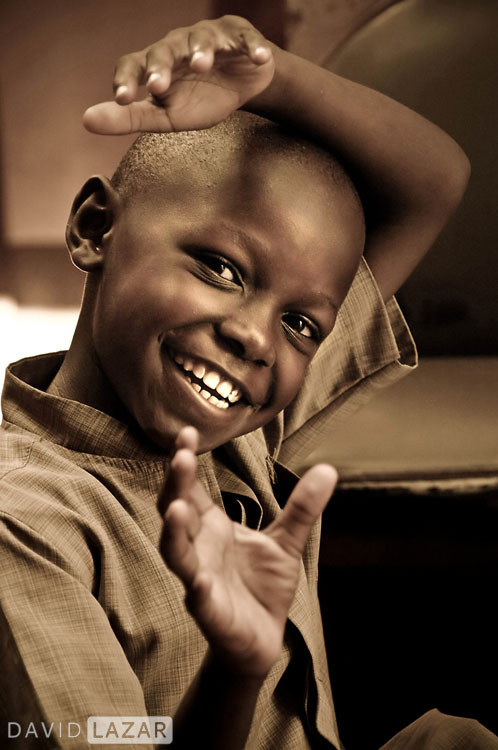 I try to take portrait of children around the world ! Difficult exercise for a beginner ! Your tips helps ! Thank you much for sharing a such great advice..It’s really very helpful for me..
I’ve always enjoyed looking at your pictures. Will help if you could also share how you post process your pics, thanks! Thanks David, you are an amazing artist. Great portraits!! Thank you for your thoughts that went behind the creation. 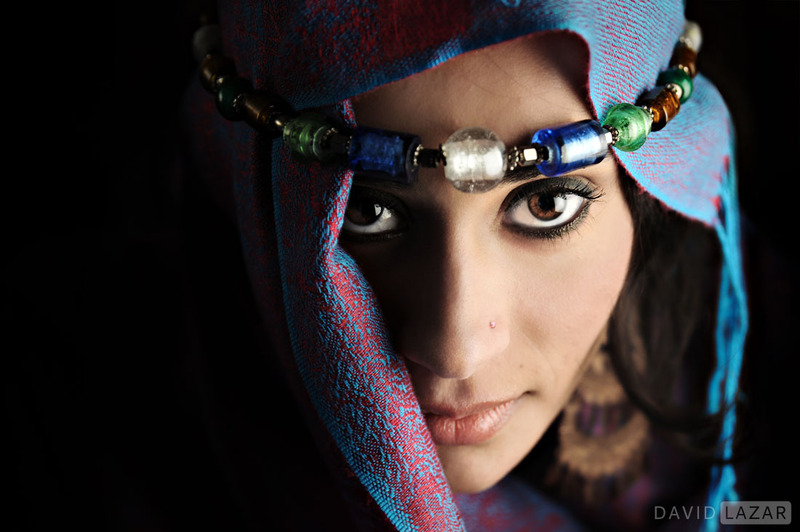 Do you prefer certain lens and aperture for portraits? What gear do you use and what lenses do you take for travel portraits and other travel photography? Thanks. Hi Vina, I have used a Nikon 24-85mm lens on all my portraits so far – but new photos from now on will be with a Nikon 24-70mm f2.8 lens that I purchased in 2017. I don’t have an aperture of choice – depends on the situation – but I suppose for most a high aperture (low number) is best to ensure the fastest possible shutter speed (to avoid blur from hand shaking) and also for a blurrier background. Excelente trabajo y gracias por compartir tus experiencias a todos.